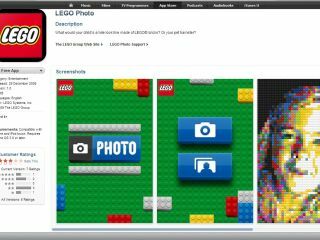 If, like us, you have often wished to have the ability to turn the real world around you into a Lego simulacrum of reality, then the new Lego Photo app for iPhone has been designed almost specifically for you. And while the new Lego app is not the brick-building Lego sim that we have dreamed about, it is still a pretty damn good little fun distraction to show off to your mates down at the new year's eve booze-up tonight. The newly-launched Official iPhone Lego App is two things that we like. It is both awesome AND free, so you really do have no excuse to not play around with Lego photos today. Unless you have still not bought an iPhone or iPod touch, that is. Head over to the iTunes App Store to grab the new turn-reality-into-Lego application to live out your plastic brick-building fantasies right now via this iTunes link. Now all we want is a proper Lego app, so that we can truly pretend to be five again any time that we like!